Hello everyone! I have been absent from the Blog-sphere for a while, but I’m back – finally! I had some minor health issues that have been resolved and my sewing has returned! Yippee! A well-fitted white shirt has been declared an essential item in today’s wardrobe. We have been told that we can dress up the white shirt by adding a suit jacket and look “professional” for any occasion. 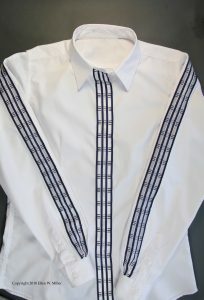 That’s all well and good, but why settle for a plain white shirt when you can embellish the shirt in a few hours to make a unique garment? 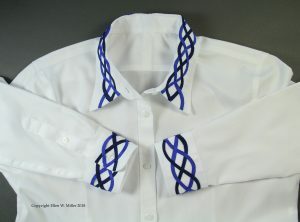 By adding ribbon, lace, some cords or Seminole Patchwork you can create a beautiful shirt with original details. I bought some white shirts from a local discount clothing store and embellished each with a different technique. Using fabrics and trims from my stash, I used a number of techniques to embellish each shirt differently. 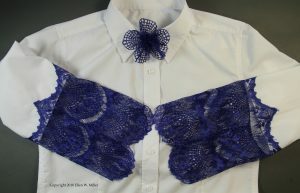 Inspiration is sure to strike after seeing these beautifully embellished white shirts. I will post the directions for one or two of the embellished shirts in a future post; I promise. 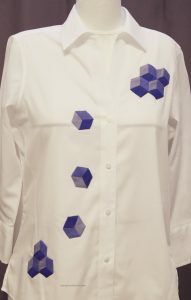 Since my sewing mojo has returned I created a new shirt that I hope will interest quilters: a Tumbling Blocks embellished shirt. I know several quilters who would like to show off their quilting skills, but you can’t exactly wear a quilt to work, can you? 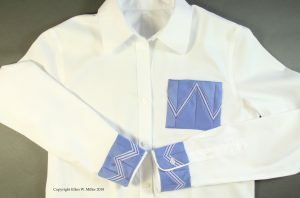 The Tumbling Blocks shirt uses a plain white shirt, with a set of blocks sewn onto one shoulder. Then several single blocks tumble down the front of the shirt, ready to join some mates at the bottom of the shirt. I think the Tumbling Blocks work well enough and are fun enough that I’m now playing with the Spool of Thread pattern. What do think? Do these variations on quilt work interest you? Sorry that you weren’t feeling well, but it’s awesome to have you back! I’d like to cast my vote for instructions for the four strand braid shirt 8-D.